All garden & gazebo product options are available in a variety of grades ranging from vertical grain clear to utility. BCL can offer any size of lumber you may need for your garden project. 1" to 36" in thickness / width and 50' in length. PLease note that Bear Creek Lumber does not sell garden or Gazebo Kits, we only sell the raw lumber to build them. 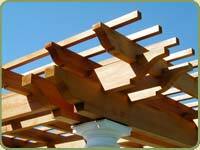 Western Red Cedar, Alaskan Yellow Cedar, Port Orford Cedar and Redwood are the most commonly used species of wood for building gazebos, and other garden projects. 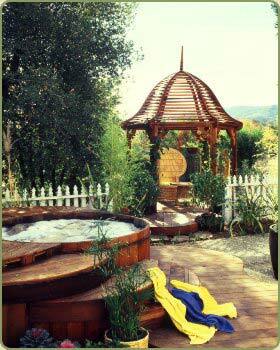 Redwood garden structures images and information. 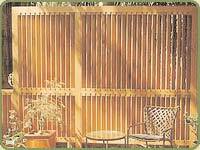 Western Red Cedar a classic wood specie for outdoor uses, from gazebos to hot tub paneling, trellises and fences. Left: Redwood gazebo and decking. 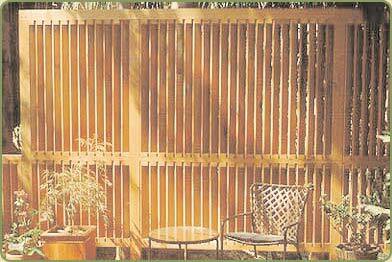 Right: A redwood fence adds privacy yet allows for breeze to pass through.